Southern Time Equipment Company has been headquartered in Wilson, NC since 1977. We have established offices in Charlotte, NC and Winston Salem, NC including service offices located in Wilmington, NC and Charleston, SC. We are logistically close to interstates and main highways and can easily service our clientele throughout the Carolinas. We at Southern Time take great pride in the fact that we do not just sell and service parking equipment; we are innovators. We understand today’s parking technology and how it will evolve in order to satisfy tomorrow’s needs; thus, this allows us to better serve our clientele. In fact, we too have developed various enhancements to many systems (or completely new systems in some cases) in order to better resolve customer’s operational dilemmas/requirements. Our ability to provide quality equipment and efficient, dependable service has allowed us to be successful in meeting the high demands of some of the largest parking facilities in both North and South Carolina. We can confidently say that we have the experience and resources to support and maintain software/hardware based systems. See our service area. We specialize in access and revenue control systems for all parking facilities whether they be “On-Street” or “Off-Street”. This includes on-site equipment installations and software support for municipalities, hospitals, universities/colleges, airports, property management companies, manufacturing facilities, and operation centers. We also provide custom “In-House” developed software solutions for any size of parking operation. Previously a highly accredited FederalAPD and 3M dealer, we like so many others, had to acquire a new parking line once 3M ceased their parking business. After examining many parking equipment lines, we determined that the best fit for Southern Time, and our clientele, was Designa Parking Systems. We became a Designa dealer in 2017. After the perfect match was recognized by both parties, Southern Time’s controlling interest was purchased by Designa in 2018. We are proud to now be an active member of the Designa family. We look forward to showing you what we believe is the most superb parking equipment and customer support currently anywhere in the world. 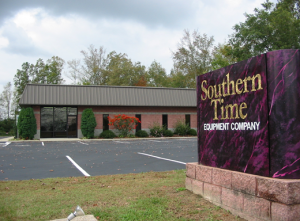 For immediate help or information contact us at 800.849.5654 or email Sales@SouthernTime.com.